This weekend went by way too fast with another two days of Christmas markets at Pineuilh this time. There were around thirty stands this week there was a real community feel and most exhibitors were local. My stand was opposite the local school stand and there was a great turn out for the two days. I had lots of visitors. Thank you to Hanni, Emma, Julie, Basil and Olivia from my French class and Helen from Chateau Claribes for coming along and having a chat and for buying some jewellery. I also had a long chat with Anne and Alan who intoduced themselves. They are also Scots and have moved into Saint Philippe recently. The Scottish contingent in the commune is now up to five! There are two funny tales to report from the weekend. The first is about a little girl who looked gorgeous in her vintage velvet Santa dress and hat. She was running round having such great fun, but just as we were packing up to go home on Saturday, there was an unholy uproar and she was in tears. Everyone was concerned. What had happened? The pom pom had come off her hat and she was inconsolable! The second story proves that my French is still far from perfect. Just when I though it was all falling into place, a woman stopped and asked something about my greetings cards. I thought she was asking if the were blank inside, and I said there was nothing in them. I guess that is not what she asked as the look on her face said it all and then she walked away….. This week’s photo shows the large crowd gathered round Pere Noel. It has been quite a while since I have ‘done’ a French market. So there was quite a bit of hunting around for the bits a pieces for the stand, which I found had been stored mostly in what we call the ‘big barn’. This in turn led to quite a lot of cleaning and washing of an accumulation of two years grime. Finally, everything was collected up and I was ready to go. We had been told to arrive at 8 am an hour ahead of the official opening time. After a week of frosty mornings, it was disapointing to have rain, but we ran in quickly with our boxes. 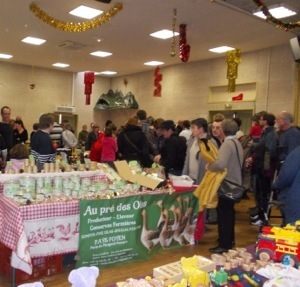 It was a really lovely venue – part of the Mairie in Le Fleix and we were in a small hall with 3 other stands. The market was well organised and there were super crowds, both morning and afternoon. I was sorry to have missed a very good online customer who had arranged to collect an order, when I went home to have a plate of soup and thaw out. However G had a good blether with her and I’m sure we will meet another time. My other customers of note were a lovely couple who have a herd of alpacas, somewhere near Montpon. I love working from home, but it can be tricky getting through the to do list. There is just so much scope to get involved in other things that are more enjoyable. All the important things always get done, like processing orders and going to La Poste, it’s the less attractive things that I don’t always manage. And French homework.. I have noticed more and more that the page gets turned in my ‘to do’ book and there are a few things still lurking there. Not being around much last week, and with the hospital ordeal over, this seemed like a good week to get up to date. The customer database was brought up to date, other bits of website maintenance and a number of French phone calls made (they rank along with French homework). French homework is started too, and I am actually quite enjoying it. It is a children’s book called Histoire d’une muette et du chat qui lui apprit a voler. (Story of a seagull and a cat who teaches him to fly). Anyway, no problem with the first telephone call and I am now booked into the Marche de Noel at Le Fleix 33220 on 2 December. I hope also to do the Marche de Noel at Pineilh, but that has involved a lot of French beurocracy. I must write to the Comite des Fetes to explain what I do, before they will send me a form to apply for a place. 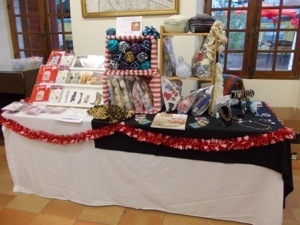 This is a wee Christmas fair in a suburban village hall! Very little is ever straighforward here. I have also been busy looking out baskets and things for the stand and have been working on some more kniited gems. 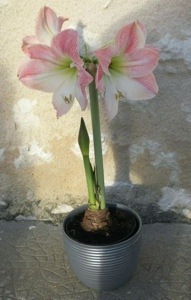 My picture this week is of my gorgeous amaryllis. No procrastination here. From dry bulb to this in three weeks is impressive!